Chris Crounse, left, and Darren Van Heusen recently opened Hank Hudson’s Brewing Co., at the Fairways of Halfmoon Golf Course. They have an assortment of IPAs, pilsners and ales. Chris Crounse and Darren Van Heusen have opened a new craft brewery and taproom, Hank Hudson’s Brewing Co., at the Fairways of Halfmoon Golf Course. 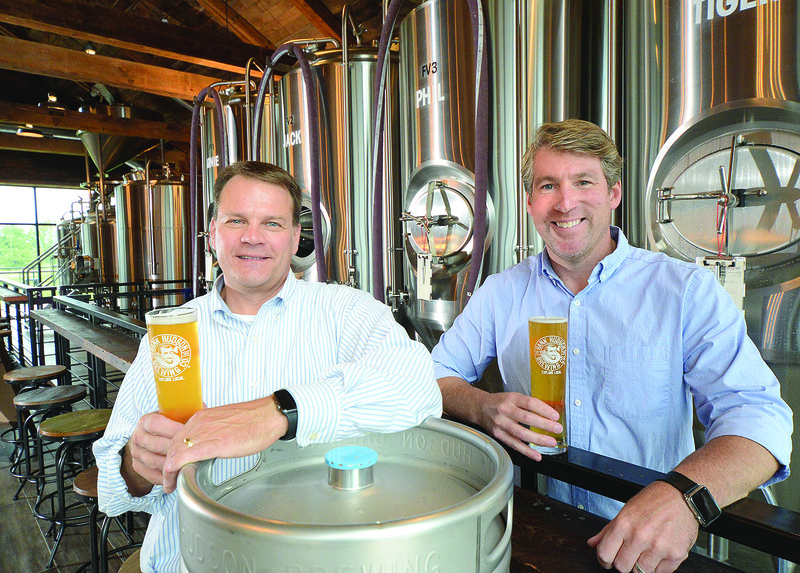 They are hosting a grand opening, dubbed Hanktoberfest, from 1-4 p.m. Sunday, Oct. 14. The taproom is newly constructed in the space between the Fairways clubhouse restaurant and the pro shop. The interior is constructed of reclaimed barn wood from two local farms on nearby Farm to Market Road. The seating consists mainly of long communal tables that facilitate friendly dialogue among fellow beer lovers as they sample pours from the 16 different taps at the bar. It has a large stone fireplace and sliding glass doors that lead outside to a deck area. Outdoor patio seating is available in front of the taproom. Amid the rustic décor are eight stainless steel fermentation tanks that dominate the room. The two partners first became interested in craft brewing while deciding what to do with the money they’d made as part of an informal monthly “stock” club. Crounse, Van Heusen and some other friends would meet once a month for beers and wings, pooling their money to make stock investments. When some of the other members began to lose interest, Crounse and Van Heusen found themselves sitting on a small nest egg that they’d raised over the last five years. Around the same time, the men, who have also taught together for 20 years at Scotia Glenville High School, met their new school principal, Pete Bednarek, who was involved in forming Wolf Hollow Brewing in West Glenville. “When we heard about it, Chris and I kinda looked at each other and said, ‘That sounds like fun,’” said Van Heusen. The money they’d earned through the stock club provided them with the seed money to begin a brewing operation. Van Heusen, whose stepfather, Bruce Tanski, is owner of Fairways, arranged to use part of the large basement of the clubhouse facility and they began experimenting and learning about the brewing process. Van Heusen, Crounse and Tanski had already begun to investigate the licensing they would need to accommodate a brewery on the premises. Five years later, with the new licensing in place, and after a lot of experimentation with different formulations and recipes, they were ready to open the taproom. Hank Hudson’s took about two years to complete, from the planning and permitting stages to the construction and design phase. Crounse and Van Heusen worked with the architectural firm of Balzer and Tuck, of Saratoga Springs. They received their certificate of occupancy in June and their liquor license came through in August. The pair came up with the name Hank Hudson’s because of the close proximity to the Hudson River, named for explorer, Henrik Hudson, whose ship was named the “Halfmoon.” Crounse, a history teacher, thought it was a perfect way to pay tribute to both the explorer and the Fairways of Halfmoon golf course at the same time. There are 16 taps on hand, featuring an assortment of their own IPAs, pilsners, blonde ales, stouts, and amber ales. They also feature two craft beers from Wolf Hollow. The beer menu changes with the seasons. A fall brew will be introduced the Oct. 14. They are in the planning stages for winter beers, said Crounse. Management at Fairways and Crounse and Van Heusen hope Hank Hudson’s will open up the Fairways as more of a year-round destination, instead of one reliant only on the golf season and private events. With more and more new homes being built nearby, the partners say they have already attracted a lot of people from Clifton Park and Mechanicville, as well as the immediate surrounding area. “The people really are enjoying the space,” Crounse said. Hank Hudson’s offers both beer and kitchen service on Thursdays, 4-9 p.m.; Fridays 4-10 p.m.; Saturdays, noon to 10 p.m. and Sundays noon to 8 p.m. By the start of the 2019 golf season, they will be open seven days a week.